If you would like custom designed hoodies for a sports team or company, be sure to visit Spotlight Apparel for ideas and cool ways to design your own hoodie. The art of screen printing uses woven mesh fitted over a frame and ink blocks to neatly and easily apply images onto fabric to create sharp, polished looking apparel. As a result, custom t shirt can be created for just about any occasion. Custom designed hoodies for your recreational sports league, custom work shirts for your employees or cool customized t-shirts for going-away presents or some other occasion are a great way to brand your team or company. But why stick with just regular old t-shirts when screen printing services offer a wide variety of apparel? Custom designed hoodies, in particular, are an excellent choice of apparel to have screen printed, for a number of reasons. They last longer and they’re more likely to be worn and seen, which means people will get more use out of them. The biggest advantage of custom designed hoodies is that you can do more innovative designs on them than would be possible on a t-shirt. 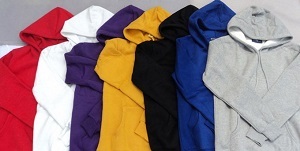 Here are a few cool design ideas you can use to make awesome custom designed hoodies. One cool way some people design their custom designed hoodies is to add text or images to the sleeve. A short phrase or saying would look great on the sleeve. Imagine, for example, a sports team putting a tough phrase like, “No Retreat” on the left sleeve and “No Surrender” on the right. If you have a small logo or symbol that you’d like to add to the design of your customized hoodies, why not put it on the hood? Printing on hoods is pretty uncommon, so it’s sure to attract a lot of approving attention. Use Every Part of the Hoodie For One Fluid Design. Some innovative designers have even gone so far as to use the entire hoodie as part of one fluid design to make almost a mini costume. It takes a lot of imagination to be able to come up with such an intricate design, but these customized hoodies are pretty amazing, to say the least. To get an idea of what this might look like; check out some of the customized hoodies that Marvel has come out with, that look like their characters’ costumes. Customized hoodies may cost a slightly more to make, but it’s as the old adage goes: “You get what you pay for.” Not only will people get more use out of them, but you’ll be able to make a much more dynamic, exciting design on them than you would be able to on a t-shirt. Be sure to contact Spotlight Apparel, Inc. of Jacksonville Florida for all your custom designed hoodies. Posted in Screen Printing and tagged custom designed hoodies.